Open the launch pad and look for an icon named "other" showing smaller icons inside. 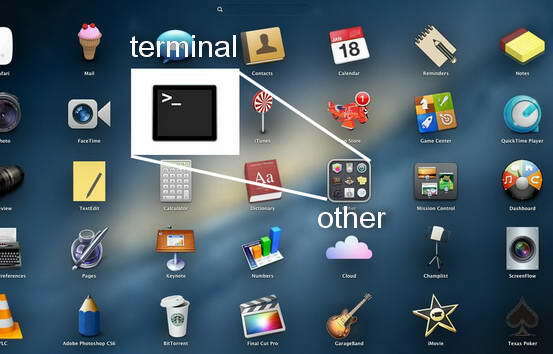 Open that and find the "terminal" icon. We recommend you get the DVD - same price as a download - unless you really can't wait 2 to 3 weeks or unless you are in one of the Pacific Islands where we can't mail the DVD to you. If you are in New Caledonia you can get the DVD from Noumea Ocean - at Port Sud Marina in Noumea. Call Chloe first to arrange a meeting. Her phone number and a google map showing her location are on her website www.noumeaocean.com. If your computer does not have a DVD player you can transfer the files from a DVD to a USB drive to install the guides on your computer. Or, you can use Chloe's USB stick to transfer the installation files to your computer. If you have a very good Internet connection then go ahead and download the guides - but you can't download the installation files and activate the guide successfully unless you download the files with freedownloadmanager. First download and install freedownloadmanager. Open freedownloadmanager then click and drag the link from the email onto the freedownloadmanager window and drop it there to start the download. 4. After the download is finished, continue with the activation instructions below. Sometimes the download stops just before finishing. If it does, click on the pause icon then on the resume button and it will finish. OK, let's see if we can fix it. If the speed drops to zero and stays there for any length of time make sure you are still connected to the internet and, if not, fix the internet connection problem as quickly as you can. If the download indicator does not automatically begin showing the download speed again, open the freedownloadmanager window and click on the pause button. Then, after that changes to a play icon, click the play icon to resume the download. 1. Double click on the installation file INSTALL-MAC-VANUATU-CRUISING that you downloaded from the Internet or from a USB drive or a DVD. This will open a window with two icons as in the following image. 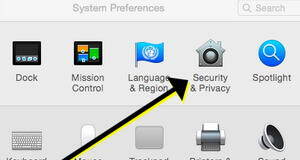 Put your cursor over the INSTALL-MAC-VANUATU-CRUISING icon on the desktop and two finger click on it and select Eject. 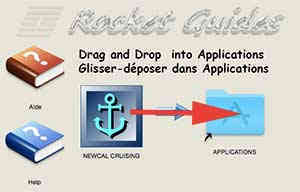 You have installed the guide into the Applications folder. 3. On the task bar (bottom of your desktop screen) click on the rocket ship to open the screen showing all your applications. You might have to swipe your fingers from right to left on the trackpad to move to the last screen where you will find the anchor icon for VANUATUCRUISING. 4. Double click on the anchor icon and a window will appear. 3. Type the website address ncvan.us/vmac into the txt file. 5. Go to ncvan.us/vmac, log in using your username and password. Open the applications folder in Finder and scroll down to the VANUATU CRUISING folder and double-click on that to open the folder, then click on the VANUATUCRUISING.app to see the date the file was modified. We are constantly updating the guides with new images and information. Check on the store page Store for the latest version date. You missed step 5 in the installation process and have tried to start the guide from the installation package, not from the applications folder. The installation file is a compressed file to deliver the software. 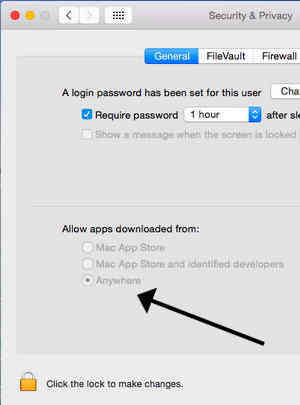 You need to move the software from the delivery package to the applications folder by dragging it's icon into the "applications" shortcut. 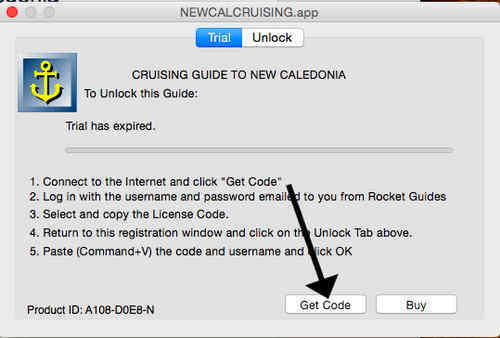 After you have moved the software from the installation package to your Applications Folder and have ejected the installation package use Finder to go to the Applications Folder, scroll down to the VANUATU CRUISING folder and double-click on that to open the folder, then double click on the VANUATUCRUISING.app to start the program and register the activation code. Open the Application Folder and the VANUATU CRUISING folder and Control+Click on VANUATUCRUISING and select "open" from the menu that appears. 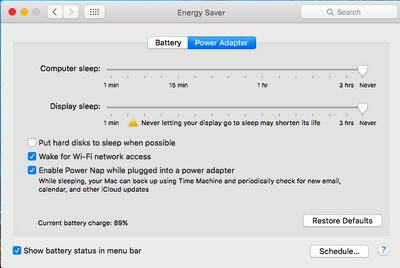 Then click "open" in the window warning you that this is an app from an unidentified developer. If that's not the problem, try this work-around. 1. Move the VANUATU CRUSING folder from Applications, into Trash and empty the trash. 2. Open the INSTALL-MAC-VANUATU-CRUISING.dwg installation file that you downloaded or from the DVD. 3. Drag the Anchor Icon out of the Installation window onto the Desktop. 4. Eject the INSTALL-MAC-VANUATU-CRUISING.dwg installation file. 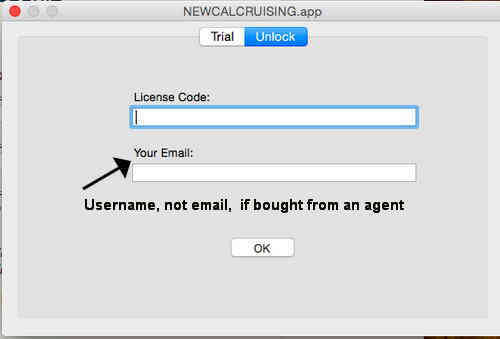 3. exactly what happens when you double click on the VANUATULCRUISING.app on the desktop.